This is the first of the series. Grab a napkin, you’re going to be drooling soon. After eight years as an engineer, Tim Ma traded in blueprints for recipe cards and went to culinary school at The French Culinary Institute – now International Culinary Center – in New York. 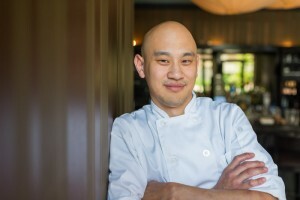 Chef Tim Ma of Maple Ave Restaurant and Water & Wheel Restaurant. Photo by Rey Lopez / Under a Bushel Photography. Following an externship with the Momofuku restaurant group and other culinary jobs, Tim returned to Virginia, where he had lived since age 10, to pursue his dreams of opening a restaurant. “I’ve been doing this for about six years now and have loved every minute of it,” he says. Tim and Joey Hernandez opened Maple Ave Restaurant in 2009. The remodeled donut shop seats 28 folks and offers French-Asian cuisine. Wall & Water opened in 2013 showcasing New American food. At Maple Ave, a consistent favorite on the changing menu are the Crème Fraiche Wings, a dish of wings in fiery Korean chili paste tempered with cooling Kendall Farms crème fraiche and garnished with scallions. Maple Ave has is currently ranked Number One in the 50 Best Restaurants by Northern Virginia Magazine and named among the 100 Very Best Restaurants by Washingtonian Magazine. Tim was a guest chef for the James Beard Foundation Celebrity Chef Tour on Aug. 4 and will cook at the James Beard House in New York for the Virginia Rising Stars dinner on Sept. 9. He was nominated a Rising Culinary Star in 2013 and 2014 for the RAMMY Awards presented by the Restaurant Association Metropolitan Washington. I think that sophisticated cuisine will start to bleed into casual cuisine more often that what we are seeing it now, and make what once was considered fancy food more accessible to more people. I love to make myself soy sauce braised beef noodles. It can be any kind of noodle, but the beef needs to be super tender though. Add some pickles, and maybe some bok choy and I can eat that every day. Adult yogurt, baby yogurt, toddler yogurt, five takeout boxes from five different restaurants, and milk for my cereal. I’m not a big wine drinker, but it’s hard for us to keep any RdV Vineyards wines in stock. AleWerks Brewing Company’s Shorty Time Session IPA; I couldn’t drink enough of this. We have it on tap now, but it is a very limited edition. To me it’s very important to support local, but also very important to support responsible. Responsible meaning that processes be it a Virginia peanut or grass-fed beef, it needs to be done with the properly with the current and future generations in mind. We source a lot from Polyface Farms for both restaurants. We also like to promote as much Virginia agriculture as we can. I love Polyface Farms for not only their incredible products (rabbit, pork, beef, chicken, eggs), but for their incredibly sustainable practices. Virginia does provide such a wide range of products that are just fantastic, apples, peanuts, etc. There is something special happening right now with Virginia cuisine. Chefs are reconnecting with the agriculture as well as with other fellow Virginia chefs … and [it’s] not just what is happening in the upscale cuisine space, but also the casual eateries are becoming more craft, less commercial. Chef Travis Milton of Comfort. Photo by Beth Furgurson Photography. Restauranting is in Travis Milton’s DNA. His great-grandparents owned a small restaurant in Castlewood, Va., where his mother worked both in the kitchen and dining room. “She would bring me in with her, and I would sit in a highchair in the corner of the kitchen and peel potatoes with a very dull butter knife. I learned quite a bit. I got my first restaurant job at 15,” says Travis. Over the years he has worked with such notables as Chris Cosentino of Incanto in San Francisco, Todd Gray of Equinox and Fabio Trabocchi of Fiola, both in Washington D.C., and Wylie Dufresne of WD-50 in New York before settling back in Virginia. Travis is a native of Russell County in Appalachia. 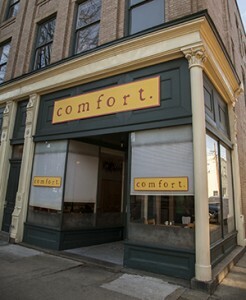 Comfort opened in downtown Richmond 13 years ago by Jason Alley and Chris Chandler and has since become a stalwart of the capital city’s dining scene. Travis joined the team three years ago. 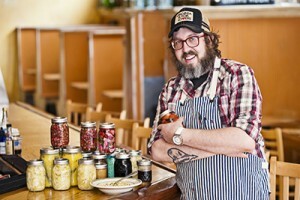 Dishes change frequently, but Travis is noted for his Cheerwine Vinegar Pie (Cheerwine is a Southern, cherry-based soft drink) and sour corn, an old Appalachian dish of open-air fermented corn which is drained and sautéed in bacon fat. Travis has won many awards and accolades, including having his Green Tomato Pie named as a favorite in the Best Dishes of Dixie August/September 2014 issue of Garden and Gun magazine. A pot of soup beans and a pan of cornbread. Comfort. Photo by Sarah Hauser. For wine, it’s a tie between Boxwood Winery’s rose’ and Barboursville Vineyards’s Octagon. For beer, it’s Hardywood Park Craft Brewery’s Gingerbread Stout. Where I grew up, the concept of ‘farm to table’ is just a normal part of life; the bulk of what you ate was grown or killed by you, someone in your family, or a neighbor. 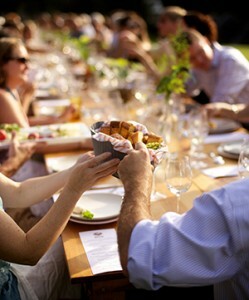 [Incorporating Virginia foods and foodways] is about honoring and preserving. I try to do what I can to preserve them and showcase them for the many that aren’t aware. [I have many favorite Virginia ingredients], Sam Edwards’ ham is the first thing that comes to mind. I am a sucker for the indigenous beans of Appalachia, my favorites being Greasy Beans and Turkey Craws. Craig Rodgers of Border Springs has some outstanding lamb, Adam Musick has some excellent pork, there is Autumn Olive Farms, and Lockhart Family Farm … I could go on and on. Its diversity. You have a rich culture of foodways that are ages old in the mountains, as well as the amazing heritage of the Eastern Shore and everywhere in between. John and Karen Urie Shields of Riverstead. Photo by David Hungate. 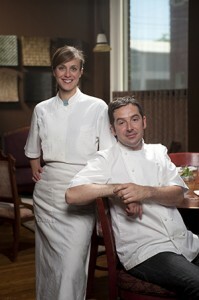 Like so many chefs, inspiration for John Shields came early in life; his from from his father. 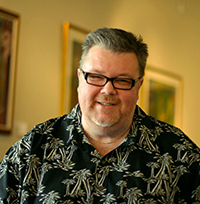 After attending culinary school in St. Louis, John made his way to Chicago. He began work at the famed Charlie Trotters restaurant there, where he would meet Karen, his pastry chef wife. John cooked at Alinea, also in Chicago, where he worked with his mentor, Grant Achatz, who is noted as a leader in progressive cuisine. Then John and Karen left the city for the country, and found a home in western Virginia, running the acclaimed Town House from 2008 to 2012 in the Appalachian hamlet of Chilhowie. 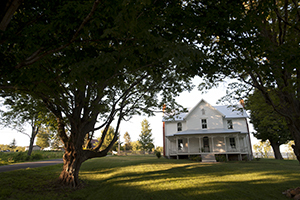 Now the couple operate Riverstead, an inn and private dining restaurant set in the same charming Smyth County locale. From a charming renovated Victorian house overlooking the beautiful bucolic countryside, the Shields host a culinary adventure in the intimate 14-seat dining room. Meals are booked in advance on Riverstead’s website. Although the menu is constantly changing, look for dishes like duck hearts that are brined and grilled over the yakitori, with licorice-like flavors of dried beets, bronze fennel crowns, tarragon and black olives along with swiss chard leaves, cured egg yolk and a sauce of dried tomatoes, fermented blackberry, duck jus and brown butter. Riverstead. Photo by David Hungate. Over the years, John’s creative cuisine has garnered many accolade from publications like the Washington Post and Garden & Gun magazine. He’s a James Beard Foundation Awards semi-finalist, and a Star Chefs Rising Star. In 2010, Food & Wine magazine named him Best New Chef. I think we’ll start to see more chefs banding together to do collaborative dinners and food conferences around the country. I tend to cook a lot of eggs. I love eating them, but cooking eggs properly, no matter which style you decide, takes a tremendous amount of technical skill and knowledge. Eggs, lots of vegetables, lots of fruit, yogurt and beer. I love Fabbioli Cellars’ Tannant 2011; I also love Foggy Ridge Cider. I enjoy Devils Backbone and Blue Mountain breweries. I think any smart cook embraces the ingredients and product that are close to them. Obviously the product will be fresher, but it also evokes a story. When I’m using sour quince juice from the guy down the road to make curd, it’s special because you can’t taste or experience it anywhere else. Local food benefits the environment and wildlife. Well-managed farms provide ecosystem services: they conserve fertile soil, protect water sources, and sequester carbon from the atmosphere. 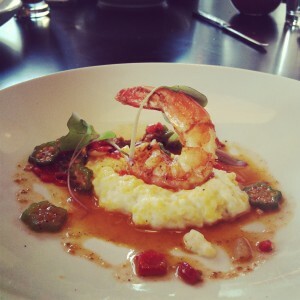 I love [the ramp]; it’s versatility … charring, caramelized, fermented in goats milk whey … the list goes on and on. Virginia just feels so fertile, and the products are so diverse.